So first things first, this show takes place sometime in the future. We see short glimpses of the original series being played back on a monitor, and get some dialog about how it has been a long time since the evil Decepticons were defeated. We find that this small group of Autobots to which we are introduced are on repair duty for warp bridges out in the depths of space. Optimus Prime is their leader, but this is not the confident and heroic commander we have come to know from the previous shows. Nope, this Prime is a rookie, filled with self-doubt and stuck out in space with the rest of the repair crew, far away from anything important... or so they thought! To the groups surprise, they accidentally stumble across probably the most important thing in the universe while clearing away some rubble from one of the warp bridges... the Allspark! What makes it so special, nobody is quite sure, but it is said to have the power to create life, so the group brings it on board. Unfortunately, before they have a chance to get the Allspark back to headquarters, they are confronted by a Decepticon ship... commanded by Megatron! In their desperate attempt to escape, the Autobot ship winds up crash landing into Earth, along with a seemingly destroyed Megatron. Landing in a Detroit lake, fifty years pass by before the Autobots are awakened. Seems a robotic experiment in a nearby lab went out-of-control, and is now threatening everything in it's path. The Autobots want to help, but first jump into a chamber which alters their vehicle-form appearance, giving them the ability to transform into Earth vehicles so that they can blend in. It soon becomes clear that vehicle forms just aren't going to cut it against this blob monster full of nanomachines, so they have no choice but to reveal their true forms. But even then, it's going to take more than individual efforts to bring down this source of destruction! And that's just the tip of the iceberg. Eventually the Decepticons show up (you knew it was coming), forcing this ragtag group of Autobots get to learn more about themselves that they ever thought. 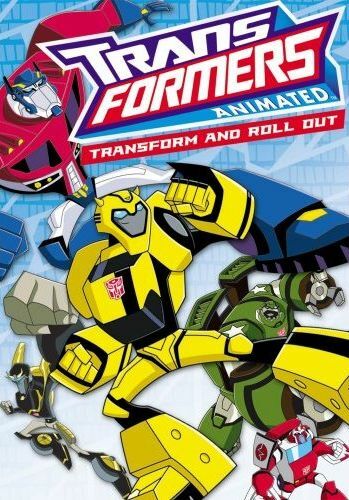 Unlike the original series where the Autobots basically knew they were heroes, these guys had no desire to test their mettle and take on the forces of evil. But when innocent human lives are on the line, turning tail is not an option. And I think this dynamic really helps bring the show and characters to life. The character designs are a little off-putting at first, but it doesn't take long to become attached to them. And I think they are way better than the live-action movie designs. Megatron even has his iconic arm cannon, though he turns into a jet rather than a gun (latter he takes the form of an Earth helicopter). Actually, a lot of the characters have designs which are reminiscent of the original series. Optimus Prime turns into the cab of a semi truck, though now he has emergency lights on top and is classified as a futuristic fire truck. Prowl doesn't resemble his old police car self, as now he is a motorcycle, but Bumblebee is still a little yellow car. The designs are a great nod back to the original series, as are other touches such as giving Optimus Prime an axe and keeping Starscream a deceitful second-in-command to Megatron who wants nothing more than to take over as Decepticon leader. There is a lot more human interaction throughout this series, with the Autobots not just fighting Decepticons, but also dealing with various mortal supervillians and other various human problems. What else? Well, the dialog is all pretty good too, lots of clever banter and quick one-liners. Overall, there is really a lot to like here, so definitely check it out if you have the chance.